By Gabrielle. Instagram shot by Ben Blair. Oh my goodness you guys. This one is for all the Paris lovers and dreamers out there. I can not wait for you to see this episode! It feels magical to me. I could just watch it forever. I love seeing such a magnificent place through a child’s eyes. You can find out a little backstory about this episode here, and for those who are curious, Betty’s pom pom hat and over-the-knee socks are from Tea Collection. Please tell me you love the video as much as I do! P.S. — Huge thanks to Tiger in a Jar for the gorgeous footage, to Merrilee Liddiard for the beautiful title illustration, and to our friend Caroline for helping out the entire time! I had a dream last night that I took my daughters to Paris. Then today you post this. I’m not one to believe in signs but…. This was so lovely! Thank you for sharing. How many times can I say LOVE! Totally LOVE this and makes me want to take my two little ones right now. Awesome!! Glorious! I adore the part when she nibbles on the pink Ladurée macaron and the world turns pinkish….ah, la vie en rose! Your comment made us all smile! We’ve been debating if the scene was to subtle. So glad it was easy to comprehend what was happening. Here’s to la vie en rose. My favourite part too – just subtle enough! So beautiful! My favorite part is where she drops the coins to pay for the snack. What is it about that part? I love it too. I think it’s cute that she’s just a kid but responsible enough to eat alone and pay/tip as an adult. It’s a great shot! Hello I just found your video super charming! We recently made a few videos with our kids (we only have 5 ) and this one made me think of the first one we made. I’m Australian and my husband is Swiss and we live in the north of France! I guess in a way we see France a lot like you do! Here’s the link for our video on youtube if you have the time………. By the way I’d love to do participate in a ” living with kids” post with you some day! Love the video. A quick tour of Paris with your darling daughter made my day here in gray Cincinnati. I loved the last part with the double- decker merry-go-round and the Eiffel Tower in the background! As a huge fan of both Paris and Tiger in a Jar I clearly love this to the bones. Beautiful put together and really cute. Props! I love it! The first time we see Betty skipping when she is so far away is so charming. And that rose-colored moment is perfect! Can you believe that shot? She looks so independent and confident. This reminds me of the book Caroline visite Paris. You probably know the series by Pierre Probst? Such a sweet little movie. I’d say she’d like the book too! Betty did such a fantastic job! Tourism to Paris will definitely go up after watching this lovely film! And thank YOU for such a kind comment, Tricia! So glad to hear that this added a dose of happy to your day. i love it! since moving to paris 6 months ago..we’ve have visited all of these places..and have had many rides on that same carousel. it never gets old..wish i knew when you were here to film..would have loved to have watched!! what a wonderful keepsake and great job betty! even though baguettes, croissants and macaroons are so stereotypical, it’s what you’ll miss the most. make sure you eat lots of them! What good advice, Giulia! They’re stereotypical for a reason, right? We recently took my three year old to Paris, and he loved every moment of it. He talks weekly of moving to Paris, and so do I. ;) LOVE the video! this gave me goosebumps…many of the sites on the video i have visited with my husband and boy do we dream to return with our 4 sons to the same spots someday…. your daughter – what a sweet & precious soul! thanks for the inspiration. Gabby, this is just too much loveliness together!! She is the most beautiful and subtle tourist guide ever. It’s like a piece of a movie, well done!! My girls couldn’t believe how independent she was and how wonderful Paris is. “subtle tourist guide” — I love that description! This is absolutely delightful, Gabrielle! It almost made me cry, this is the charming Paris I love! I shared it on my FB page. Hope all Paris lovers will see it! Thank you, Maria! We are truly so appreciative when people share our videos. This is so lovely! Must keep saving for Paris! It really is magical. The Tiger in a Jar crew are incredibly talented, and so is Betty. It’ll preserve your memories of Paris–and even better, I think–of Betty at this moment in time. Love this so much! One of my favorites. Betty is a doll. My girls and I love to watch the OliveUs videos. We always cuddle up on the couch and watch the new one twice in a row. It’s a fun little tradition. I really want to learn how to make some videos myself. Obviously they won’t be as wonderful as yours, but I still think it would be fun! I had to read your comment aloud to Ben Blair. We’re both grinning! I loved this! It sums up perfectly how I feel every time I go to Paris. Merci! Tiger in a Jar nails the details! That pyramid shot at the Louvre? Gold! Ohh, so very sweet! Paris is so magical, no matter what age we are! Adorable! I love the red socks. This made my heart happy. That’s it. Planning a Paris trip RIGHT NOW. I’m french and live at La Defense, I love your video. I like to see Paris through new eyes ! How absolutely precious. I could watch it over and over. Loved the part where she drops change at the cafe–it made me smile so big. The carousel at night was lovely, too. What a work of art. Just beautiful. I actually found myself tearing up at the magical shot of the carousel at the end! Makes me pretty teary too. Tout à fait adorable! Loved every bit of it. My daughter was around Betty’s age the last time we went to Paris. She is now 17– I think we need to go back! Wow. That is such a work of art. I am blown away and DO love it as much as you Gabrielle. It really inspired me to want to be creative in outstanding ways. Thank you for such a treat! Yay! Yay! I’m so glad. Gabrielle, thank you for sharing such a beautiful video! Betty did great! I will be sharing this episode and the other episodes with my 5 children! Adorable!! So adorable. Betty has a charming skip and it is such fun to see her skip through all my favourite parts of Paris. I love that you can tell she says ‘merci’ when the waiter brings her the hot chocolate and croissant. Utterly exquisite and magical! I adored the skipping by the Seine, and it just kept getting cuter and cuter. I agree on the magical comments! I love the music, especially. The music was actually created specifically for this episode by a friend of Tiger in a Jar named Luke Williams. We’re so pleased with it! Simply lovely. Perfectly magical. Brava! are you kidding me? What a delight and how clever. I love how the capturing of the monuments with the finger shapes. NICE! This is so cliché I can’t like it as much as you guys (but that’s bcause I’m french, we don’t see Paris the same way) but it’s still super cute; I like the idea of a little girl exploring the city on our own, shopping and tipping with confidence! 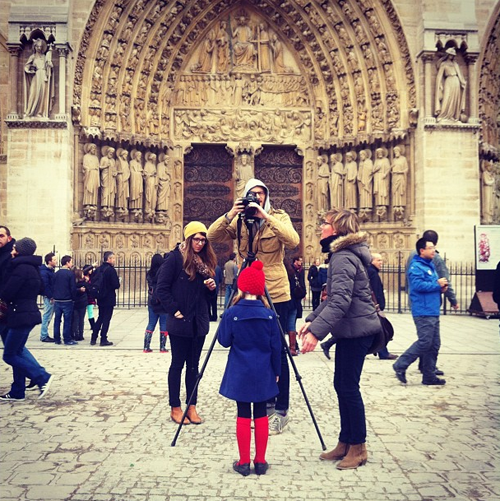 Loved this video and I can’t wait to take my kids to Paris one day! You had me at the baguette! I love it! Adorable, sweet, charming, etc. This is my favorite by far. I love this! So so cute. I love Paris and this is such a wonderful way to capture the city. I remember going at that age with my parents and the statues and gargoyles and artists were definetly my favorite part. Makes me want to make a film like this with my son while we are living here in Germany. Thank you! It’s such a treat to watch kids in a city and see what they observe. I hope you get to make a video with your son! Betty looks like an all-round excellent person to be around. I love the cafe scene best. Perfect ‘cafe manners’. I think we should all make something similar of our own cities. Wish we had made one in Wellington, New Zealand when we lived there. My little one was 2.5 when we left but she still talks about her ‘favourite cafe’ and she is 5 now. This is utterly charming. My favorite. Oh my stars! Betty exploring Paris is bringing a smile to my face – ear to ear! I’m showing this video to my middle school art students today! We’ve been studying artwork from the Louvre! I love this one! I used to live in Paris as a teenager and it truly is a magical place. I had to smile when she ate the baguette on her walk – I could never get a baguette home in one piece – they’re too yummy! And la vie en rose! How perfect! Here’s to hoping I get back there someday soon! A warm baguette is a treasure. After she makes the face with the gargoyle she does this tiny laugh. It is just a second. Totally her own response. Love. I love Betty’s laugh, too! Everything just works together so well–Betty’s sweet face, the magic of Paris, and the lovely music. Very cute! How lucky is she to have this film forever! I have a feeling generations to come will appreciate this. Magical! What a treasure for you to have these little videos of your time in France. One of our favorites for sure! Betty is so adorable. She was made for Paris! I’m a Paris lover and dreamer; this is perfect. Beautiful. Amazing. Feels like a (very) short film. How lovely! Votre video me rappelle tellement de souvenirs! Absolument adorable! Thank you thank you thank you for transporting me back to my favorite city on earth. The lens color change, the architecture she mimics with her hands and body, her playful spirit… it was just so uplifting and beautiful. Something about the red hat and her gnome-like sweetness reminded me of 2 films: Le Ballon Rouge and Amélie. Well done! C’est trop mimi! Bien filmé! This was so sweet! Definitely my favorite episode yet. My husband served his mission in Bordeaux, and we often talk of going without our kids; but this video made me ache to take them with us! Another wonderful episode! And you are definitely making my heart ache for a trip to Paris! So charming! It makes me smile. That shot at the end of her on the carousel is stunning. I love the cafe scene too. It’s just perfect. Thank you for brightening my day! It is exactly how it feels to be in Paris! The melancholy..the beauty…the inspiration. Betty, in her own way, captured it perfectly. I adore this episode!!! Everything about it is just perfect. Well done :) It brought back memories of my high school trip to Paris, and my husband and I are hoping to visit the City Of Light for our 10 year wedding anniversary in 2014. I can’t wait! Oh I LOVED this video. In fact I adore all the Olive US short films. I have all girls and one evening I wanted to show them the one of you all cleaning up after dinner. It was quite inspiring for me since I think I need to put in a more fun into our everyday tasks. After that one they watched all of them! They love them. Please continue to make more. My family loves them. Thank you for also sharing your amazing trips and experiences abroad. What a fun family you have. This is so stinkin’ cute and I feel incredibly inspired. How utterly dreamy. I do think I love it as much as you, or perhaps not quite since you’re her mama! It’s the 2013 version of “The Red Balloon” without any of the melancholy. Ahhh! Little Betty, she is so adorable. This was so great, favorite Olive Us episode thus far. I loved the part where she ate at the cafe as well as when she made lion faces. Way too cute, and she just made Paris not only seem beautiful but so fun and relaxing. Much love to your family! I live in Paris but have to admit I don’t love it as much as most of the other expats do…but watching this video, I had one of those moments where you step back and go, Wow, I live here. Thanks for making me appreciate what I have. My 5 and 2 year old loved this episode! They giggled out loud when Betty growled at the lion. At the end my 2 year old said, “I want more Betty! !” Thanks! This was better than the Red Balloon. At the end, I felt happy inside–not just happy, but full of joy and delight! My children have been enamored with images of Europe lately, and my oldest has especially been loving Paris. This was perfect for her. I served a mission in France. While I can explain some things to them, seeing Betty on the cobblestones explained it to them much better than I ever could have done. They LOVE it. We watched it three times yesterday and they want to watch it more. My daughter and her friends have been having parties about different countries (so far they’ve done China and Greece). The next one is about France, and we’re hosting it. We added watching this movie to the list of things that we are doing. This is so beautiful. It showed them what I cannot explain to them in so many ways. I am making baguettes and citron tarts for them today. Macarons are on the menu for next week. That was perfect. Absolutely perfect. This video is so lovely! I showed it to my fourth graders for a creative writing exercise and they were enchanted! They were able to write thoughts, feelings,poems, or a story about her. They all agreed that she was very lucky to get to eat by herself! Oh my goodness, this is so heart warming! I just love her eiffel tower jump. It’s precious! Gabrielle, this is a great video that she will love forever. That was just incredible. I cannot imagine how much she will love to watch that as a grown up. What a terrific idea. It is beautifully shot and makes me ACHE to go back to Paris. With my daughter this time. I don’t know you or Betty and I’ve never been to Paris but I just sat here mesmerized by this video! LOVE!!! I just discovered you through pret a voyager and this video is so beautiful I could cry! I look froward to discovering more on Design Mom. Thank you! Oh I love the Olive us series, I just followed a link from MIL to find this one … unbelievably cute, it takes me back to my youth when I spent a brief few years in Paris …. … I’ve clearly been a bit slow btw, although I have loved Olive us for ages, I never put 2 and 2 together and linked it to you at Design Mom – doh!! Love! Showed this to my 3.5 year old, who has been obsessed with the Eiffel Tower lately, and she promptly requested it again . . . and then watched all of the other Olive Us episodes (which she requests by saying, “Can we watch another Betty?!”). She then spent the next day discussing whether or not she would ever meet Betty and if Betty would want to play with her. Your sweet Betty has made another far off fan! Skipping on the stones of Paris, baguette in hand, a grown up sit and sip at a sidewalk cafe, standing tall like the Eiffel Tower…bliss! Thank you for the joy!